I so do not like darkness falling upon us an hour earlier now. It feels that the afternoon barely gets started and it's night time. But then you get afternoon light that makes for photos like this. So, how can I complain. 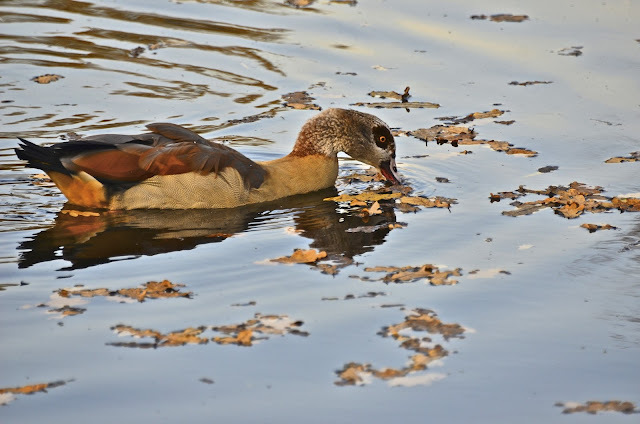 I was rummaging through my photos for World Bird Wednesday and I had forgotten that I had taken some of the wildlife in VondelPark in Amsterdam. 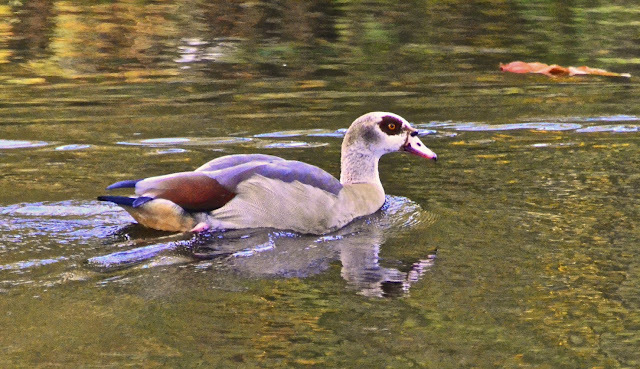 I have no idea the names of these lovely duckies but I loved their unusual colors and black eyes! Anyone know their names? I think these pups also find them quite interesting ... but for different reasons, I imagine! Hope your week is going well. I can't believe it's only two weeks until Thanksgiving. Seems like I was just basking in summer days. Such beautiful photos! I can't help with the name of the duck but it sure is an interesting one. Oh, WOW!! That first shot is awesome indeed -- makes fall worthwhile doesn't it? I love these colorful ducks! Your photos are superb as always, Reena! I don't like Daylight Savings Time either! The days are so short now!! Hope your week is going well -- even with the short days! Can't help you with the duck ID but they sure are beautiful as is that first image. *yawn* I can barely stay awake until 7:30!! How bad is that? Your first picture is so stunning!!! I hate it when it gets dark early, too. I don't know why we can't just keep daylight savings time all year. The day IS just started and then it gets dark. Love the ducks, I have never seen any like them, let us know if you find out what they are! I don't know those ducks. I did a few minutes on google image with your duck but no duck luck. It's not a wood duck which are very pretty also. A great series of photos. The color is all the photos is just beautiful. Pure gold Reena. Thanks for sharing your talents. An African species that was introduced to parts of Europe in the 18th century, and now breed in a lot of areas. Egyptian Goose. I love 'em. A very beautiful set of pictures. The first one is stunning. Perfect light and color. Wonderful photo work. 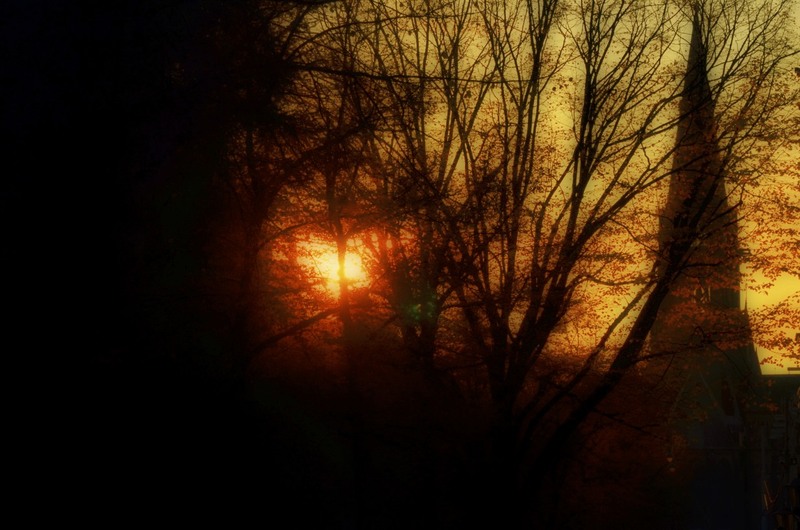 You have captured a special moment Reena - with a touch of the ethereal! I too find it hard now that it is getting dark so early. I was fortunate enough to capture a beautiful picture of a Great Blue Heron yesterday. Great shots!! I love the way you have caught the sun on the water... just stunning!! Those ducks look utterly unreal, like a child had painted trepans. What a beautiful sunset!! Your pups sure want those ducks BAD!!! 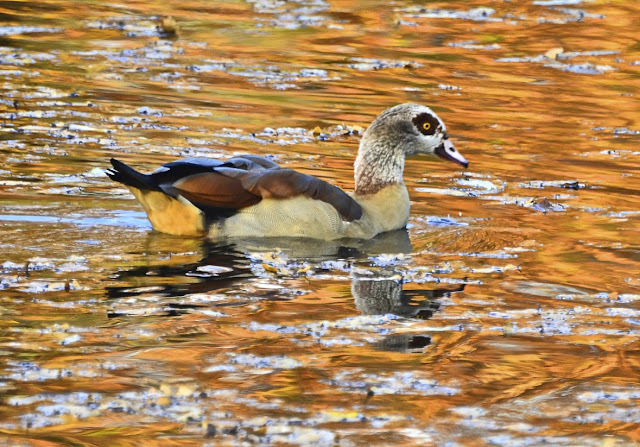 The 2nd duck shot with the fall colors reflection is great as is the 3rd with the floating leaves. Whoa there puppies! That sunset is beautiful. And what cool looking ducks. 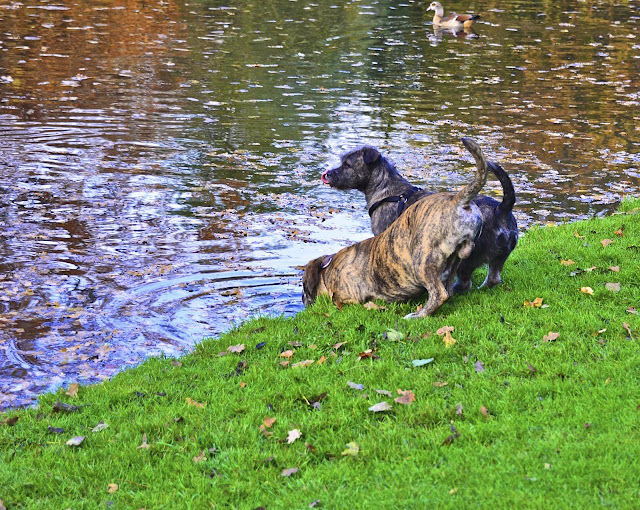 Even the dogies like them..
Oh Reena, the stories I could tell about hanging out in Vondel Park, Amsterdam back in 72-73. My worldly education started there! That first shot, has the Dutch Masters written all over it, sublime light! Yes, I am adjusting to the Fall Back and the short afternoon too and not very well. Early to bed, early to rise these days! Fall is beautiful! Too bad that winter is just behind the corner. Brrrrrrr.... :) Have a great Wednesday! LOVE that autumnal shot .. what effect did you use? the first shot is wonderful - atmospheric and I know the feel of the day by looking at it. great capture Reena. I don't know what kind of ducks they are, but I love the rings around their eyes. and the reflections are awesome. happy day to you Reena. me thinks the beautiful pups are thinking of Thanksgiving Duck on the menu... they are amazing and beautiful, dogs and ducks. Nice photo of an Egyptian Goose, a stunning bird, particularly on that coppery water. I remember the first time I saw one in Germany. I sneaked up to it to take a photo and found that it was quite tame; and later found that it wasn't a rarity at all but an introduced species. Big disappointment! Lovely shots of the goose -- the dogs are cute too! Wonderful photo in the afternoon light. I always love your subject matter and processing. Such deep, rich color in these. Wonderful images to see Reena.. Impressive aren't they? Boom & Gary of the Vermilon River, Canada. The days do seem awfully short, though I DO like the longer mornings even if the afternoons have been cut. Beautiful photos, the reflected colours in the water are great. I so agree with not liking it getting dark early. I was sitting here at 6:00 last night thinking it must be almost time to go to bed. Beautiful photos, Reena! That's a very different looking duck. I like it! Reena , that first photo just took my breath away - so gorgeous! The ducks are beautiful, with the glittering light and reflections as are the two dogs on the bank! When you said it's two weeks until Thanksgiving -- I'm like "what?" No way! But it is. You are right -- where the heck is our year going? This is an Egyptian Goose -- here's a link with a photo gallery. Looked like a duck to me too! i like the earlier sunrises but the evenings are long!! your first photo is just gorgeous, the setting sun forms a perfect heart!! very pretty "geese", they sure do look like ducks!! Well goose or duck - they are amazing! You post the neatest things! Are those your dogs? never seen a duck with dark circles around their eyes. Each and every one of your pictures is incredible! I have never seen these birds before. They are lovely. Your dogs are beautiful too!! Beautiful shots of the goose Reena! I love that second one with the golden background! Hi there - other people have stolen my chance to show off! Such is life. Very nice bird all the same. Haha, I loved the dogs and their anticipating look to the water! Breathtaking shot of sunset. Nope don't know name of ducks, but they are just "ducky." You must be a "Summer" child - you seem to not be able to get over it that it's gone, but it will return, sweetie - I promise. My week is going great. And yours? Cheers!! The only thing I know about ducks, I'm afraid, is that they taste wonderful with orange sauce. I just now noticed that you had a link for me on your sidebar. Thank you! I've reciprocated. Reena, that is such a gorgeous shot of the sun. I love the colors. I heard someone say 2 weeks until Thanksgiving today and I was a bit surprised!